I basically jump at the chance to get my hands on any review copy of a Disney movie these days. Not only do I love the long standing tradition of animation from the House of Mouse, but I also like showing these older films to my daughter who has a fairly set rotation when it comes to her movie choices. 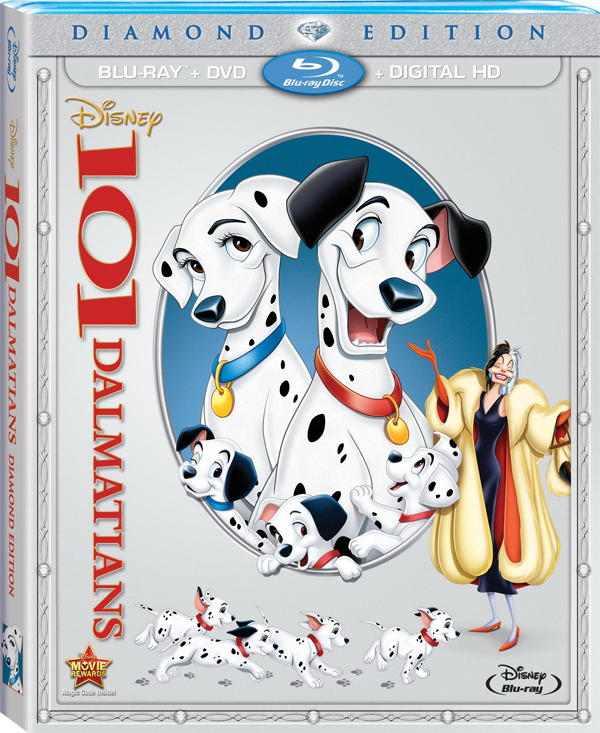 So, when I got an email about 101 Dalmatians: Diamond Edition , which hits stores today, I was easily excited. Luckily, our 3-year-old was in an open-minded headspace when this set came in the mail because she was pretty jazzed to watch it (not something that happens all the time). She might not have been instantly familiar with this film from 1961, but she does watch a lot of Disney Channel which means she’s seen the interstitials featuring some of the puppies which convey messages like “wipe your paws” and “take a nap.” That was enough to get her in and we’ve watched the movie probably six times since then. It’s become a solid family favorite. While watching the film, I realized that I’d never seen 101 Dalmatians all the way through, at least not in the past two and a half decades. I kept remembering plot points from Lady And The Tramp and possibly Oliver And Company, so the plot of this movie was mostly a nice surprise. We start off with Dalmatian Pongo narrating about his pet Roger who needs a mate. Soon enough he spots fellow dog Perdita and her pet Anita. Soon enough the two couples are married and puppies are expected. Enter the villain of the piece Cruella De Vil who wants the puppies to make a coat out of. She sends her thugs to steal them and when the humans can’t figure out where the puppies are, Pongo and Perdita use the Twilight Bark to convey word to other dogs. Thankfully, this works, and the parents go on an epic journey to get a whole lotta little dogs away from the baddies and back home. I enjoyed this story quite a bit because it moved along quickly and didn’t lag. The marriage happens quickly, the parents get on the case as soon as possible and the movie doesn’t really slow down in the last 30 minutes or so as the long trek home kicks off. There’s even some pretty funny moments that have me laughing out loud — though less so, now that I’ve seen the movie so many times. Here’s something I thought of while watching the movie that I want to run by you, faithful readers. 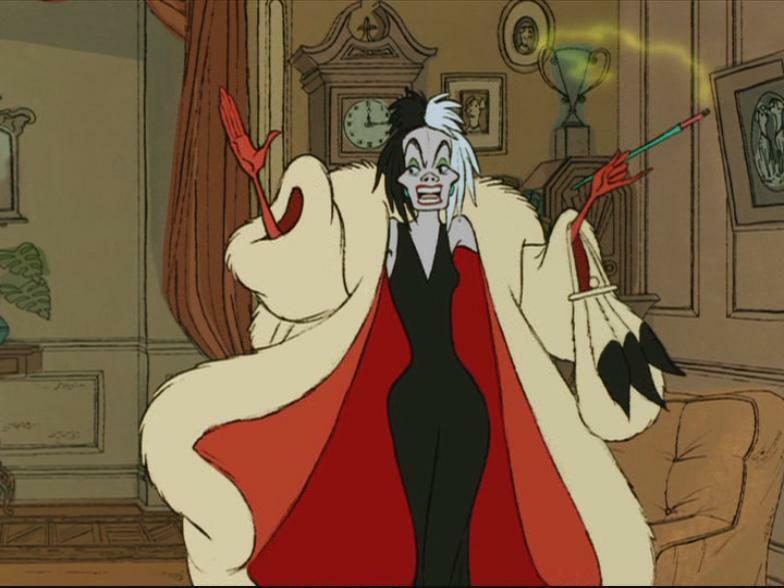 Is Cruella De Vil the worst Disney animated villain around? I’m thinking she is because her whole goal is to murder the children of the protagonists. Who’s worse than that? Scar offed his brother in front of his kid, which is pretty bad, but this is basically mass murder, right? Let me know what you think in the comments. Since this is a Diamond Edition, it’s packed with extra features, including a batch from the first DVD release. I haven’t had time to dig into those or any of the commentaries, but we did watch “The Further Adventures Of Thunderbolt” which is a fun continuation of the cartoon the dogs watch before their adventure continues. There’s also a cool episode of Walt Disney Presents called “The Best Doggoned Dogs In The World” from 1961. Canine-centric, the episode not only features videos of dogs walking on two legs that had me howling (puns! ), but also a presentation of the film to get viewers excited. While watching the black and white episode, I realized it must have been a trip seeing ads for the movie on TV and then going to the theater and seeing the whole thing in color. Musta been pretty cool. Anyway, I thought this film was pretty great and my daughter agreed. She didn’t seem too creeped out by the super-evil Cruella, but mileage may vary other kids. A good test is probably to show your kids her first appearance and see how they respond. She sure gets crazier, but that’s a good baseline for her scariness. If they don’t like that, it’s probably a good idea to hold off on more 101 Dalmatians until later.